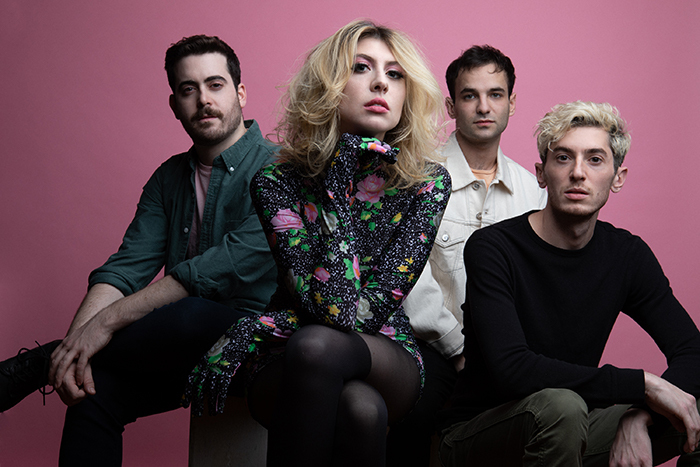 The members of Charly Bliss have known each other, in one capacity or another, since middle school. But they have perhaps never felt closer than last year when they took part in the kind of high octane bonding ritual that makes or breaks a relationship: walking in LA. "I know this is the joke, but literally no one walks there," says frontwoman Eva Hendricks, laughing. "People were looking at us like we were crazy." There was a kind of meditative determination that took over as these super-pale, die-hard New Yorkers ventured out into the stifling smog on their way to the legendary Sunset Sound studio, where they were recording their forthcoming sophomore album, Young Enough. "It was just the four of us being alone together, getting our heads on straight," Eva continues. "It felt like we were really locked in. It was so good." Feeling conspicuously out of place together was exactly the right energy for Charly Bliss to tap into at this moment. Challenging each other to be exposed, to be seen for who they really are as people, and then to double down on the sound that emerged collectively from that process is the story of the band’s evolution from the scrappy upstarts who made 2017’s brash punk LP Guppy, to the confident, assured artists behind the comparatively dynamic, unapologetically pop Young Enough. "We definitely go to different places on this one," says bassist Dan Shure. "But it still sounds like us. It’s still fun."